Schematic capture or schematic entry is a step in the design cycle of electronic design automation (EDA) at which the electronic diagram, or electronic schematic of the designed electronic circuit is created by a designer. This is done interactively with the help of a schematic capture tool also known as schematic editor. When you start learning about electronics, you might see a circuit diagram drawn with realistic looking drawings of the different components. But this method is not very effective. To make them more effective, all electronic components have been assigned much simpler symbols. And wires are drawn as lines to show how to connect them. It’s not always easy to understand a circuit diagram. But with practice and experience you will understand more and more. What is a circuit diagram? A circuit diagram, or a schematic diagram, is a technical drawing of how to connect electronic components to get a certain function. Each electronic component has a symbol. After seeing a few circuit diagrams, you’ll quickly learn how to distinguish the different symbols. How do you read circuits diagrams? Reading schematics is actually pretty easy. Each of the lines are wires. These show how the components are connected. If you want to build the circuit, you only need to get the components specified, then connect them as shown in the circuit diagram. This can be done either on a breadboard, a stripboard or you can design your own printed circuit board (PCB) if you like. 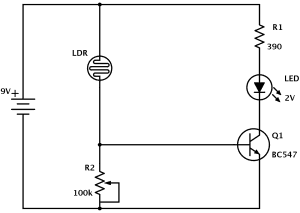 A circuit diagram should be specific enough so that anyone can make the circuit just by following it. You don’t actually need to understand it in order to build it. For example, look at the image above. I can buy a light-dependent resistor (LDR), a potentiometer, a resistor, an LED and a transistor. Then I can connect these on a breadboard by following the lines on the circuit diagram. I would then have a circuit that has the specific function that this diagram was made for – without necessarily understanding why or how it works. How do you understand how it works? Understanding how a circuit diagram works can be a bit tricky. It comes from experience. You recognize the way some components are connected and identify known pieces of the schematic. In the circuit above for example, I would see the LDR together with the potentiometer in the middle. 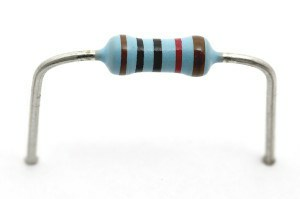 I know from experience that two resistors setup like this makes a voltage divider. And I know that the voltage out from a voltage divider is a result of the values of those resistors. I also know that the resistance of an LDR varies with the amount of light it receives. This means that the voltage out, i.e. the voltage on the base of the transistor, will vary with the amount of light detected by the LDR. Then I look at the transistor. 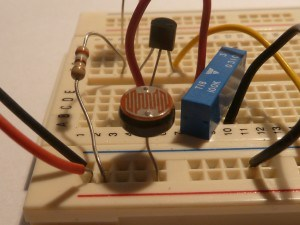 I know that the transistor can be turned on and off by applying a voltage at the base. So from this information, I would have an idea that this circuit will turn on and off the LED connected to the transistor, based on the amount of light the LDR receives. BUT, if you are a beginner and you don’t know what an LDR is, what a transistor is or what a voltage divider is, then you won’t have the foundation to understand the circuit. So you need to start by learning those parts first before you can understand the circuit diagram. Understanding comes with experience. You start by understanding small circuit chunks and later you’ll learn to identify those chunks in a bigger circuit diagram so that you can make sense of the big circuit diagram. But you don’t have to understand a circuit diagram to be able to build it. That’s the cool thing! You can build things beyond your understanding and as you progress you will learn and understand more and more. I appreciate your article very much. Wait for your next writing.